You may be great at what you do - you have a phenomenal message, you do life-changing work, you're seriously a game-changer. But the reason you have yet to blow up and your business has yet to take off? No one has heard of you. You may be thinking, 'Duh, Amanda. Tell me something I don't know...' I get it. 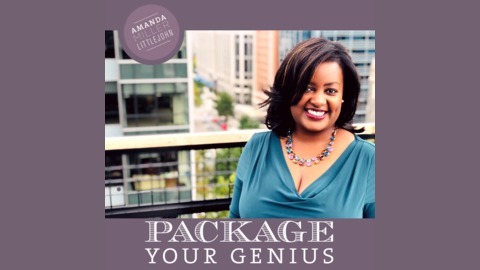 If you're here because you're interested in building your personal brand, you probably already know that you want more people to know about you. But what you may not know is this: you have more power over the fact that no one knows about you than you think. And that's because the main reason no one has heard of you is YOU WON'T TELL PEOPLE WHAT YOU DO. And if you do tell them, YOU REFUSE TO REPEAT YOURSELF. You don't have more opportunities on the table because you're not telling people you're open to working with them. You're not telling people how they can take advantage of what you have to offer. Or once you've told them one time, you're not following up by reminding them. You can't say it just once, as my husband says, you have to be a broken record. You have to tell them, then tell them again. So how do you make it so that people have heard of you? First, you have to own that you have something to share, something that is valuable to others, something the more people need. This is actually the mindset work that many people have to do first especially when they work in corporate america because corporate will have you thinking you're nowhere near as good as you actually are. But that's another story. So that's the first step. You have to own the fact that you're good, your skills are solid, and your work adds enough value to others that more people should know about it. Second, you have to publicly declare you're available because you can't sell a secret. So that could mean making a post about your new venture on social media. That could mean making an announcement at an industry meeting or speaking engagement. That could even mean making a list of targets and then reaching out to them one by one. But if you do reach out to people individually, you still need to have something public-facing that declares what you do like an updated LinkedIn profile or website you can link to. Last you have to keep telling people. Over and over again. Repeatedly. And here's where resistance typically shows up for most people even if they managed to get past steps one and two: You may start telling yourself you're 'bothering people' or 'getting on people's nerves' or people are 'tired of hearing about' whatever you have to share. And if you manage to share it and no one responds, or no one reaches out, you might mistake your audience's silence for indifference. You may even mistake their silence for disinterest. Listen, I know as well as anyone how nerve-racking it can be to put things out and hear nothing. It can really mess with your mind after you've mustered up the courage to announce that you do this thing and then hear nothing. It's tempting to think people aren't interested, but the reality is, they likely didn't hear about it, or if they did hear about it, they need time to process. But the silence can be deafening, and that part become a mental game. So you have to push yourself to keep putting it out there, you have to give it a chance to actually work. So this doesn't mean you mention your service once, and if it doesn't yield a slew of new clients, you stop, beat yourself up for having the nerve to put yourself out there, and vow to never mention it again. This means saying it again a few more times that way, switching your medium to social, to phone, to handwritten notes until you find the way that works for you. And then keep doing it. Tell people about what you do at least twice a week, because if you don't tell them, how you can expect them to find out? And if you don't remind them, how can you expect them to remember? Whatever your medium of choice is - however you most successfully connect with your tribe - put that on your calendar so you get a reminder. Did I connect this week? My husband always talks about my long posts on LinkedIn or my email newsletters 'missives' - he says 'I haven't seen one of your missives in a while!" so that means I know I need to send one out. Whatever your version of a missive is, maybe it's an Instagram story, maybe it's a thank you note, maybe it's a Twitter rant - be intentional about doing it. Don't leave it to chance. Put yourself in your audience's shoes - we are all so incredibly busy. Think about the last time someone had the solution to your big problem but you needed time to mull it over, to think it through, to make up your mind. Then your life got in the way - you got busy, you meant to sign up but you have a deadline to meet, or had to go do something for your kids, or got tired and needed a nap! You're busy, and the people who need you are busy too. So give them some grace. Don't be too good to repeat yourself. No one gets upset when you remind them about something good. 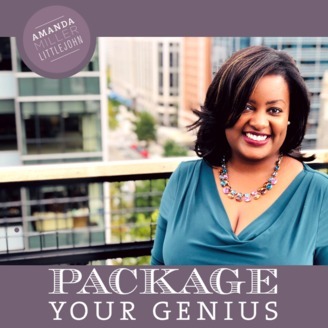 Applications are open for the next round of Package Your Genius Academy that starts in early May. To learn more about the program and submit your preliminary application, please visit Package Your Genius Academy. I'm excited to work with a few more high achievers who have a track record of professional success and need help framing their story, articulating their value to the clients who need them, and becoming more visible through media and speaking.